Larry Huang has made a career of turning good ideas into tangible results. Since graduating from the Georgia Institute of Technology with a degree in industrial management in 1973, he’s been an entrepreneur, helping to create billion-dollar companies. He’s been a race car driver, competing in the NASCAR Rolex Grand-Am Sports Car series. A former member of the Georgia Tech Foundation Board of Trustees, he’s been a philanthropist, endowing the Lawrence P. Huang Chair in Engineering Entrepreneurship (currently held by David Ku, researcher in the Petit Institute for Bioengineering and Bioscience at Georgia Tech. Recently, Huang has taken on a new role: matchmaker. Through a series of events that he encapsulates as “a really serendipitous situation,” Huang linked Mayo Clinic in Jacksonville, Florida, with a team of interdisciplinary Capstone Design students at Georgia Tech, forging a new collaboration in the evolving relationship between Mayo and Tech’s bio-community. “It’s the classic win-win scenario,” says Huang, who is a patient at Mayo, where his reputation preceded him – Huang’s generosity had previously nourished Mayo Clinic Ventures, and he’s been trying to jumpstart technology infrastructure in Jacksonville since moving to the area 18 years ago, “with limited success,” he says. But the southern stars are aligning as Mayo Clinic is in the midst of a massive $330 million expansion on its Florida campus, “to enhance research and innovation,” according to Gianrico Farrugia (physician and CEO of Mayo Clinic’s Florida campus) and Tushar Patel (physician scientist and Mayo’s Dean for Research in Florida), in a newspaper editorial they co-wrote last year. Since Huang had graduated, a thriving bioengineering and biomedical engineering community had emerged at Georgia Tech, so he knew exactly where to turn. Huang brought Mayo’s planners together with leadership at Georgia Tech, including Petit Institute Executive Director Bob Guldberg, Scheller College of Business Dean Maryam Alavi, and James Rains, who directs the Capstone program for the Wallace H. Coulter Department of Biomedical Engineering (BME) at Georgia Tech and Emory University. “So we started looking for Capstone teams with a real entrepreneurial interest, and a lot of people applied,” says Rains. Ultimately, they selected an interdisciplinary team of five biomedical and mechanical engineering students that called itself – of course – Cinco de Mayo. The team has three BME students: Dev Mandavia, Marci Medford, Cassidy Wang; and two from the Woodruff School of Mechanical Engineering: Alex Bills and Lucas Muller. If there was an ace in the hole, it was probably Mandavia, who has valuable experience when it comes to competitive entrepreneurial endeavors. He helped lead the BME team (CauteryGuard) that won last year’s Georgia Tech and Atlantic Coast Conference InVenture Prizes. Cinco de Mayo actually got a head-start on its spring semester Capstone project, making trips to Jacksonville before the semester to meet with clinicians. According to Medford, they conducted about 200 interviews with personnel at Mayo, as well as the Piedmont and Grady health systems in Atlanta. “We decided to focus on epidurals, because we realized there are so many complications related to the procedure, and we felt that we could make an impact,” says Medford. They focused on the delivery of neuraxial anesthesia (like an epidural), used extensively in the obstetric setting to alleviate pain during childbirth. With an epidural, a needle is inserted into the back to deliver drugs into the space around the spinal cord. Currently, these procedures are conducted without imaging or precise feedback that could alert the physician where and how deep to insert the needle. So, physicians are virtually blind, depending on tactile feedback and “loss of resistance” upon entry into the epidural space. Proficiency is gained and maintained only through continuous practice. Meanwhile, multiple attempts are usually made to place the needle, increasing pain and the risk of complications. The current version of the ‘NeuraLine’ device they developed uses bioelectric impedance analysis and/or force sensing, allowing physicians to identify entry into specific anatomical spaces. Other modalities may also be explored. The Cinco de Mayo team will have a better sense of its next steps following a May 4th meeting at Mayo, an opportunity to show and tell for an audience of clinicians and experts. Their device aims to improve clinical confidence, minimize complication rates, and eliminate the steep learning curve of the current practice. 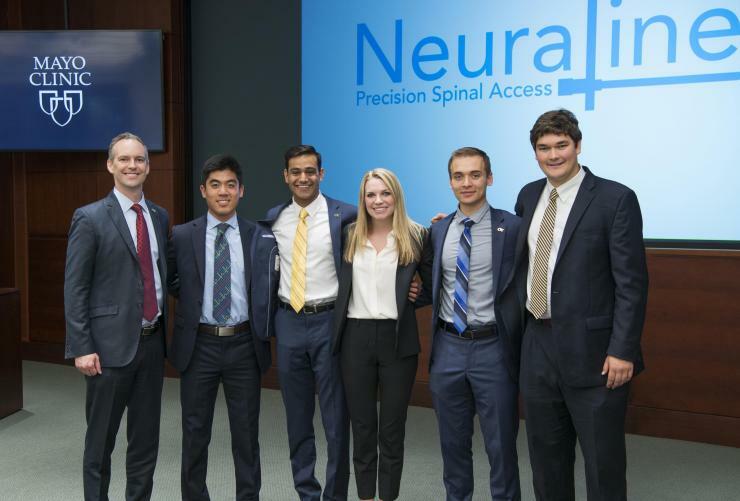 Accounting for all neuroaxial procedures in the U.S., the team estimates the total addressable market to be $5 billion. The team plans to devote itself to further development of the device this summer. Mayo already is collaborating with Georgia Tech’s bio-community in a meaningful way as an organizing partner and gold sponsor of the annual Regenerative Medicine Workshop, launched by Tech more than two decades ago and brought together each year by a team that also includes the University of Wisconsin, University of Pittsburgh, and the Regenerative Engineering and Medicine Center (a partnership of Emory, Georgia Tech, and the University of Georgia). The students and Mayo clinicians kept in touch throughout the process with weekly video conferences, looking at various approaches, as well as several face-to-face meetings, which allowed the physicians to show the engineering students the clinical arena and the challenges health care providers face during the procedure. For Larry Huang, the value of partnering with Capstone students is something he became well acquainted with last year, when he tapped a team of mechanical engineering (ME) students to redesign the intake system for the air box on one of his race cars. But this latest experience with the interdisciplinary team of BME and ME students gets closer to the core of what has driven him for more than 40 years.